We are pleased to announce the 2019 PMI-VI Professional Development Conference: Project Management in the Era of Digital Transformation and Disruption, May 6-7, 2019 in Victoria, BC at the Delta Hotels Victoria Ocean Pointe Resort. The conference will feature a full two-day agenda with keynotes, panel sessions, concurrent breakout sessions and exhibitions focused on the field of project management. We expect 120-150 delegates to join us for the conference. The opening keynote speech will be given by John Schlichter, who coined the term “Organizational Project Management” or “OPM,” which is the system for implementing the business strategy of an organization through projects. OPM became a global standard and is how companies throughout the world deliver projects valued in billions if not trillions of dollars. 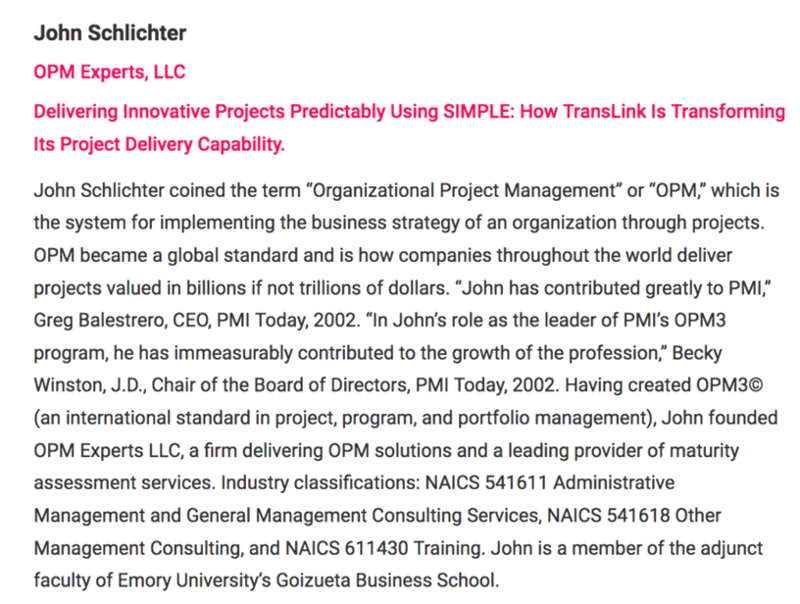 “John has contributed greatly to PMI,” Greg Balestrero, CEO, PMI Today, 2002. “In John’s role as the leader of PMI’s OPM3 program, he has immeasurably contributed to the growth of the profession,” Becky Winston, J.D., Chair of the Board of Directors, PMI Today, 2002. Having created OPM3© (an international standard in project, program, and portfolio management), John founded OPM Experts LLC, a firm delivering OPM solutions and a leading provider of maturity assessment services. Industry classifications: NAICS 541611 Administrative Management and General Management Consulting Services, NAICS 541618 Other Management Consulting, and NAICS 611430 Training. John is a member of the adjunct faculty of Emory University’s Goizueta Business School. Prior to the conference, John Schlichter will host a full one-day workshop sponsored by the PMI Vancouver Island Chapter. AI-powered robot microscopes, 3D metal printing, sensing cities, zero carbon natural gas, and driverless trains all have one thing in common: these innovations are being created by projects, temporary endeavors that require learning and produce something new or unique. The fact that they are created by projects is taken for granted, which is proof that projects have become an institution of 21st century life. Project teams span traditional corporate and agency boundaries, delivering change in constantly evolving networks, and the essential ingredients that make all this possible are standards, shared vernaculars and frameworks which enable individuals to work in teams capably. In the 1980’s, Max Wideman led a team to create PMI’s first standard describing the management of an individual project, published in 1987 as the “Project Management Body of Knowledge.” PMI’s next innovation emerged just over a decade later when John Schlichter conceived and proposed a standard describing the implementation of an organization’s strategies through projects, a system he coined the term “Organizational Project Management” or OPM to denote. This process innovation combined project, program, and portfolio management processes as an integrated system for the first time as a standard. John led the team that defined the standard for Organizational Project Management and how to develop the capabilities necessary to perform OPM successfully, consistently, and predictably, i.e. a maturity model. He named that model “OPM3,” and it has been adopted by organizations throughout the world. This was a significant departure from PMI's direction to date, marking PMI's first step toward a "strategy implementation through projects" paradigm. Marketing that paradigm has been PMI’s dominant logic ever since. In this presentation, Schlichter will elaborate these process innovations and describe the obstacles, challenges, and opportunities that punctuated their creation and led to the development of another innovation: the “Strategy Implementation Maturity Protocol for Learning Enterprises” or “SIMPLE.” Three executives from Vancouver’s own TransLink will join John on stage in a mini-panel to discuss the Organizational Project Management maturity assessment they have just completed using SIMPLE. Of the world’s major cities, only Vancouver, London and Paris have integrated their public transit and road network under one central authority with its own stream of revenue. They have over $8.1 billion in assets and 6,700 employees. With SIMPLE, TransLink is on a journey of process innovation that will transform their ability to implement strategies through projects successfully consistently, and predictably in ways that enrich the quality of life, work, and play for Metro Vancouver’s 2.3 million residents. In closing, Schlichter will describe how standards like OPM3 and SIMPLE are poised to be transformed by blockchain and deep learning in ways that promise to change the world. Enjoy our stories and opinions.